Bob Ryan: … cold tomorrow night, and the weekend’s going to start off nice. Sunny and pleasant on Saturday, about 60. I think we’ll see a fair amount of clouds in here on Sunday, and maybe some rain by late Sunday or Monday. Bill Trumbull When you were a kid, were you called Red Ryan? Bob Ryan: Oh, I was called all sorts of things. The one I remember most was … sort of diabolical friend of my father’s called me peckerhead. You know, for Woody Woodpecker and things like that. Bill Trumbull Yeah, well, nice talking to you, Bob. Bob Ryan: Never liked that one. Bill Trumbull Thank you. You want to get the lights? I’ll lock up. Chris Core: Well, turn off the mic now. Bill Trumbull I asked him a simple question. You’re going to make this place a warehouse. Okay. Bill Trumbull Breaking new ground. And speaking of heat pumps. Chris Core: Yeah, what’s the best combination you can think of, huh? Bill Trumbull I’m sweating my live spot coming up. You’re on your own here. Chris Core: Well, let’s talk about the heat pump then. Andy Ockershausen: Now, that is Washington radio. Several years ago with unbelievable Trumbull and Core and Bob Ryan, and we’re so delighted to have Bob back here in the WMAL studio. This is Our Town, and this is Andy Ockershausen. We’re all laughing because that could not have been planned, Bob. That was an ad lib of the greatest thing I’ve ever heard on radio. Andy Ockershausen: Live radio. Trumbull and Core had so much that they would make something out of nothing like that. What was he called? Bill? I always think of Bill. What was he called? Janice Iacona Ockershausen Jackie Bill? Janice Iacona Ockershausen Jackie Bill. Andy Ockershausen: Jackie Bill, here comes Bob Ryan, the man who made Washington weather fun, and the forecast fun, and WMAL fun for 33 years, Bob. Bob Ryan: Time marches on. Andy Ockershausen: … great career, and you’re missed. Bob Ryan was important to this town, Our Town, and he knows how important weather is and what it means to us. Bob was one of the originals of the four … we called it the Channel 4 Four Dream Team: Vance, Gentzler, Campbell, George Michael. I mean, it was just incredible, and he also was doing Harden and Weaver, and Trumbull and Core. I used to say, “Does this man ever sleep?” No, he’s always on the air on WMAL. Bob, welcome to Our Town. Bob Ryan: … and you’re still doing what you always loved to do. You don’t imagine how that feels. Bob Ryan: How lucky we are. Andy Ockershausen: But that’s the humor that our guys gave to … even Tom Gauger, and you worked with him to. Bob Ryan: Oh yeah. Yeah. Andy Ockershausen: Bob, you know and you were around at that time, but WMAL got changed with the FCC with Harden and Weaver doing a commercial over one minute because we had said in filing for our license we’re going to do one minute commercials. Technically, somebody ratted on us and said, “It went like two or three minutes.” So, we went down and played a tape for them of Harden and Weaver doing their commercial, “Well, you tell us when they stop doing the commercial.” They couldn’t do it because it was all over the line about everything. They would talk about everything during the commercial. We never paid the fine, incidentally. We got fined $5,000 and never paid it, and they never collected it. Bob Ryan: … had to have a news content. I started my real first full-time job in Boston at the time when WCVB was starting, Channel 5. Andy Ockershausen: I know that, Channel 5. . . . that story. Bob Ryan: Famous case where the FCC took away the license … a TV license from Channel 5 because … and WCVB promised they’re going to be doing local programming, local news, expanding the new … which they did. I mean, that was … now it’s a different world. Bob Ryan: I was in Boston … I was born actually in the Hudson Valley, and then I just went back there for a trip. It was great. And then was in Boston in research, and happened to get into TV as a moonlighting job at a UHF station that was starting a 10 o’clock news. A 10 o’clock news. Bob Ryan: Revolutionary, and it lasted for nine months. I got a call at my regular job, which was with AD Little doing something, different research, and they said, “Don’t bother coming in tonight.” I said, “Why not?” “They canceled the news.” So, that was my introduction to TV news. Andy Ockershausen: You went to college in New York State? Bob Ryan: Went to college at SUNY, Albany, and degree in Physics, and then Atmospheric Science. Bob Ryan: Well, then I got my Master’s in Atmospheric Science. My advisor was Kurt Vonnegut’s brother. Bob Ryan: Bernie Vonnegut. That was sort of good. Andy Ockershausen: Oh, my, I know . . . there on West Point, right? Bob Ryan: Yeah, and great area to watch the weather. Watch the thunderstorms over the skies. Andy Ockershausen: Watch the leaves change. This time of year I’ll bet it’d be gorgeous, huh? Bob Ryan: Yeah. Although … up there everything is still green. Here we are, middle of October, and it’s hard to tell that the leaves are staying up. Andy Ockershausen: Still a lot of them around, aren’t there? Andy Ockershausen: Is that due to the summer, or is that due to the … everything changes? Andy Ockershausen: … weather’s changed for hundreds of years, right? Bob Ryan: Oh yeah. I was just up at the Skyline Drive, took a drive up there, and still green. Still pretty much green, and here we are in the middle of October. Andy Ockershausen: Yeah, so it’s going to be a couple of weeks at least before they get to colors. Bob Ryan: At least a couple of weeks. Andy Ockershausen: Let’s get back to Bob Ryan in upper New York State. It’s a wonderful place, obviously, Albany, and growing up and going to school there, but you weren’t in weather? Weather Research at AD Little – Missile Plume or Cloud? Andy Ockershausen: You were a physicist? Bob Ryan: Arthur D Little. Andy Ockershausen: They must have made a fortune with that. Bob Ryan: And they would work for different clients. And then they had a room, much larger than this, they called the smell room where all these little fragrances and essences. So, they had a commercial side, and then I was in the government contract side. Back then it was … interested … is it a missile plume or is it a cloud? So, that’s what we were working on. Andy Ockershausen: Is it an earthquake or military shock? Bob Ryan: My first job, I get there and a month later I’m in Patrick Air Force Base working with a group that put instruments in a U2, and flying up with the U2 looking at any missile launch from then Cape Canaveral. Then to see if there was a way to distinguish between a missile plume and the clouds. Andy Ockershausen: Did you ever fly on the U2? Bob Ryan: I never did. Boy, it was something to watch them take off. Andy Ockershausen: It would take a long time to get them wings up, doesn’t, and flapping? Andy Ockershausen: Where does Boston TV come into this picture, Bob Ryan? Andy Ockershausen: I know that name. Andy Ockershausen: For the 10 o’clock news. Bob Ryan: … for the 10 o’clock news. Prepare. I had a teletype, and I had a facsimile, and that was it to get my weather information. Andy Ockershausen: You were it. Bob Ryan: That was it, because it was just a 10 to 10:30 news. Andy Ockershausen: On one station, right? Andy Ockershausen: Right, because the big power was channel 5. Andy Ockershausen: 7 was a powerhouse. Andy Ockershausen: BZ yeah. Yeah. 4, 5, and 7. Andy Ockershausen: I knew that story very well. Bob Ryan: … their license. Before the license. Yeah. Andy Ockershausen: Also, Bob, there was a great university station, I don’t know whether it was Harvard or who, was a UHF. Bob Ryan: BUR, I think. Bob Ryan: So anyhow, the anchor was Arch McDonald who had been an anchor at WBZ for years and years. Fred Cusick did the sports. Fred was the Boston Bruins, voice of the Boston Bruins, and I did the weather. Andy Ockershausen: And that was the 10 o’clock news. Bob Ryan: 10 o’clock news. 10 to 10:30 that lasted for eight, nine months. Andy Ockershausen: Why did it not take off. Bob Ryan: They, I don’t know. Andy Ockershausen: They couldn’t change the habits, right? Andy Ockershausen: I’ve heard that name. Absolutely. Andy Ockershausen: Was it an AFTRA strike, or union strike, or maybe a, maybe an engineering…? Andy Ockershausen: 60, 70 miles away? Andy Ockershausen: That’s an incredible story. Obviously you didn’t know what you were doing! Andy Ockershausen: That’s why it went over so big. Bob Ryan: No, in Boston. Andy Ockershausen: Oh, it was? Bob Ryan: No, I came back to Boston. Andy Ockershausen: On Channel 5? Bob Ryan: On Channel 5. Andy Ockershausen: That’s Bob Bennett’s station. Andy Ockershausen: I know the whole story because I was kind of in the middle. My brother was the attorney for HDH, and they fought for two years not to lose that license, and then the people, they were all educators, you know, knew nothing about Broadcast. They hired Bob. He was running New York. Andy Ockershausen: Leo Beranek, right. Bob Ryan: And wonderful people. Andy Ockershausen: He was an audio engineer, too, did you know that? Bob Ryan: Yes! Yeah, MIT, MIT scientist. Andy Ockershausen: Right! A genius. Knew nothing about broadcasting. Bob Ryan: Started Bolt Beranek and Newman. BBN. Andy Ockershausen: They did a great job. Bob Ryan: But Bob Bennett was the … but all these people signed up, also, never knowing for 100% sure whether they were going to get the license. Andy Ockershausen: They were right up to the wire. Bob Ryan: And midnight, boom. It switched. Andy Ockershausen: The Supreme Court had to rule in that, you know. Bob Ryan: Switched over, and there it was. Andy Ockershausen: Bob, we know a lot of history, but I’m involved in it from, my brother wrote a book about it, and Bob Lee, the commissioner, he wrote a book. That was unheard of in the broadcasting industry, to lose your license and get zippo in return. Bob Ryan: Zero. What was that, the 20 million dollar lunch? Andy Ockershausen: That’s what it was called, right! Bob Ryan: Something like that. Andy Ockershausen: This is Andy Ockershausen, and this is Our Town, and we’ve been talking about Bob Ryan, about his town of Boston, and probably we’re going to come back and talk about Our Town. Andy Ockershausen: And we’ll be right back with Robert Ryan. Andy Ockershausen: This is Andy Ockershausen, it’s Our Town, and having a very lively discussion with Bob Ryan, who is such a big part of the success of WRZ, and certainly the success of WMAL. Andy Ockershausen: They never, never, ever stop laughing about that. I think they’ve mentioned a name, they break up. They did that on a couple other occasions with things, because Bill would play the role … Chris would play the straight man, and Trumbull was the comic. And it worked. But tell us about, how in the world did you get from the great radio … I mean, the great TVs … and people thought that what WCVB was going to do was impossible. They were going to have so many hours of public service, and the industry said they’ll lose. They did not lose. Bob Ryan: They did it. Andy Ockershausen: They proved if you do it first class, you’ll make money at it. Andy Ockershausen: Who was here! Washington, right? Bob Ryan: And so, we decided, then the station said, “Okay, we’re going to have an hour news from six to seven in the morning.” And I thought, “That’s the end of my career.” There is nobody up at six o’clock in the morning to watch an hour of news, eye-opener news! Andy Ockershausen: Little did you know. Andy Ockershausen: Six o’clock has become four o’clock. Bob Ryan: Yeah! Now it’s four o’clock. And, three hours of news in the morning, so … but it worked, and then I did a Copeland and I switched, I did the six and eleven for a few years, and then got a call from Today Show. And then did Today for a few years, and then changes in NBC and with the head of the news division, and Willard came up to New York and I came down to Washington. And the rest is, there we are. There we are! Andy Ockershausen: What a history! Bob Ryan: And everybody was happy. Andy Ockershausen: Talking about news … there was a time when radio, there was no radio station on the air 24 hours. I think we broke the bonds when a show came on called Music Till Dawn, was sponsored by American Airlines. And we said, “We can’t get by with that,” so we hired a guy named Bill Mayhew, who put people to sleep. Bob Ryan: Yes! No, he didn’t … sure. Andy Ockershausen: We did 24 hours of news, and one thing, we had a reporter on the street named Larry Krebs, and you phone in all night long, and it was unheard of, and it worked. We suddenly became very popular, and we were not a news station. We had been music. But we shifted and got into news and weather. Bob Ryan: And weather! And the times, and I think I did some late, late night when we were in the middle of a snowstorm or something. Andy Ockershausen: They would always call Bob Ryan. Well, that’s what we started with, Ric Edelman. When it was financial news, we’d call Ric Edelman. Andy Ockershausen: You had your own hook-up there, you could get on with Gauger. Andy Ockershausen: And the guy’s all about the weather because of you, you made it so interesting. They became part of you and vice versa, because they were interested in what you were saying. Bob Ryan: And we have great weather here. I mean, anytime it snows, as you know, it still is mayhem. Andy Ockershausen: Even heavy dew is mayhem. Bob Ryan: Bill Mayhem in the night, right? Andy Ockershausen: Well, maybe… Bill was a unique talent. He could work all night, which he did for years and years and years, and yet have a full life. You know, he played golf every day. He just reversed his life, you know. When we were sleeping, he’s out working, and then we’d wake up and go to work, he’d wake up and go to play golf. Andy Ockershausen: Veronica’s something else, isn’t she. Bob Ryan: Oh, she’s wonderful. She’s wonderful. Andy Ockershausen: She was with you years at 4. Bob Ryan: Yeah, at 4. Now she’s at 7. Janice Iacona Ockershausen Leon Harris. Bob Ryan: Leon Harris. Yeah. Leon is terrific. Andy Ockershausen: Leon Harris does a great job. He’s part of the community. Bob Ryan: And that’s the thing that, WMAL and all of the stations and everything that was successful, is such an integral part of the community. Andy Ockershausen: That’s Our Town. Bob Ryan: Allan Horlick – When we were first starting, we started a digital weather … we got the NBC4.com with Dave Jones. It was under a NASA program. And so we got the NBC4.com before LA got it and before New York got it. Andy Ockershausen: Right, because you were here. Bob Ryan: And we were here. And we started in 1995. And we were doing a lot of digital things, and then showing it on television. Andy Ockershausen: Way ahead of the world. Bob Ryan: And I remember Alan said, “Well, imagine 500 channels.” There are 15,000 now! Andy Ockershausen: Yeah! There’s no limit, there’s no limit. Bob Ryan: And the remote control. I was trying to use my remote control to see something the other night. And it’s got, you’ve got 25 buttons, or I think 35 buttons! And every time I go back, I’m coming back to somebody trying to sell brass candlesticks. You know, it’s bizarre, trying to keep up with this anymore. Andy Ockershausen: He’s laughing, and he knows … you know, radio, we used to sell baby chicks at night. You know that don’t you? You know, it was all kind of mail order stuff that went on in radio. Bob Ryan: And then Willard would come in and sell the eggs. Andy Ockershausen: Willard was such a big part of Our Town and everything we’ve done, and nobody is bigger than you, Bob Ryan. We’ll be right back, we’ll talk about the recent Ryan! This is Andy O, and this is Our Town. 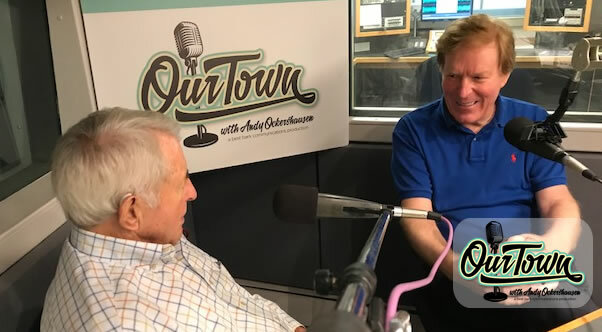 Andy Ockershausen: This is Our Town and Andy Ockershausen, and we’re having a conversation with the inimitable Robert Ryan, Red Ryan, and Bob has been such a big part of Our Town, and his days at Channel 4 and still his days at Channel 7! I forget about those things. Bob Ryan: Yeah, I went to … wonderful 25, was it 25 years, I guess? At 4, and the team, course, George … George came two weeks after I started, so we were essentially starting at the exact same time! Bob Ryan: In 1980, and then Vance, and then of course Doreen came 10 years after that. Andy Ockershausen: Right after that, right. Bob Ryan: Arch, and so that was the team. And you know what it was? People would say, “Oh, what is it like?” I said, “Everybody loved what we did and didn’t want to do anybody else’s job.” I didn’t want to do sports! I didn’t want to be an anchor, and sure as heck nobody wanted to have my job. Andy Ockershausen: No. Except Louis Allen, but that guy passed away. Bob Ryan: Well, he’s gone. Andy Ockershausen: We used to have Louis on Channel 7, you know. Andy Ockershausen: Barry ZeVan, the weatherman. We’ve had some looloos, baby. Bob Ryan: You hired some of them! Andy Ockershausen: It’s still built today, that’s the same team that’s … they’re all Vance people, like all them. Vance was the catalyst. Bob Ryan: And great fun. Great fun. And the story at Vance’s memorial, and it was a wonderful celebration of a extraordinary life. He did moon me, you know, not once, but a number of times, a number of times. I could see it coming. You know, the first time, he caught me a little bit, and I had to, I had to catch my … what the heck is the…? Andy Ockershausen: The only that saved you, you didn’t have Gordon Barnes, I mean Gordon from Channel 9. Janice Iacona Ockershausen Gordon Peterson. Andy Ockershausen: Well, Peterson was supposed to have come … but who is it that’s doing the sports on Channel 9? That missed Channel 4? Janice Iacona Ockershausen You mean Glenn Brenner? Andy Ockershausen: Brenner, yeah, yeah, would have . . . , because he drove people crazy. Bob Ryan: Oh, yeah. Yeah. There would have been a double moon. They would have double mooned me, I think. Andy Ockershausen: I don’t see that much humor in the news anymore. There used to be. Maybe guys were just doing that to get ahead, but the world has changed so much, Bob. Andy Ockershausen: They’re all crazy about the numbers, too. Bob Ryan: In Boston when we’d get snow, we’d have a 25 rating and a 35 share. Andy Ockershausen: Absolutely. But no more, because of all these channels. Andy Ockershausen: There wouldn’t have been anybody left. You had to live through that change, too. Bob Ryan: … and things like chroma key, and live radar … in my end of things, and it was really exciting and fun for me one, professionally, but then on the air and to be able to communicate that and have that team where we could go in and basically have fun, every day. We couldn’t wait to get to work on a Monday! Andy Ockershausen: I remember Channel 7, when the movies were run by a big reel of tape, but it was run out of the studios at American University, not downtown, but the thing on … that was TV. We had no tape. We had no, what do you call it, any recording device. There was no cameras. It was a mess, but it got by, because that was the early days. Andy Ockershausen: Channel 4 had a hotel. That was unique, they were all living in a hotel, the station was. And that was the beginning of television in Washington. You know, 4 and 9 had their offices downtown when they built that new . . . So Bob, you really lived through a lot of broadcast, and I’m sorry that we don’t see you every night now, but that happens. Andy Ockershausen: You had a wonderful life. Bob Ryan: I did! I didn’t study broadcasting! Andy Ockershausen: No, he just studied life, though, didn’t he? You know a lot about life when you came into that job. Bob Ryan: Well, yeah, I learned a lot along the way, that’s for sure. Andy Ockershausen: You used to show up every event that WMAL had. You’d be there, and your wife usually came to most of them. You were part of our family. Bob Ryan: And we’d go out to school visits. And then I had a crew come to record the school visit, and then I, we jerry-rigged a little, so it looked like a video tape recording, and we put it on the school cam and get the kids to say something at the end. It was great fun. Bob Ryan: No, no. We didn’t do that, didn’t do that. But we had a wonderful relation with Giant, for years. They were a great community sponsor. Janice Iacona Ockershausen No, Barry from Giant food. Andy Ockershausen: No, the little guy, he’s talking about, little Barry. Janice Iacona Ockershausen Your friend! Andy Ockershausen: My friend is Alvin Miller. Janice Iacona Ockershausen No, Barry, from… Barry. Andy Ockershausen: I’m losing it, Bob. Janice Iacona Ockershausen Yes, Olga! Olga and Barry. Andy Ockershausen: I thought they owned a restaurant. Bob Ryan: No, no, no. They were great to … and 25 years … and, from the sale of the almanac, we would donate everything to local children’s charities. Andy Ockershausen: Oh, I know. You did a great job, Bob. Bob Ryan: And so, over the years . . .
Andy Ockershausen: But that’s so much community that you were involved in that makes Channel 4 when it was great, when it was great, and it’s great now, because their people are out all the time. Fortunately for the community, the other stations are doing it too. It’s not a one-man band anymore. Bob Ryan: But, you know, but this thing in the . . .
Andy Ockershausen: You changed the world, Bob. Bob Ryan: … let’s get an AD on… the app! Our Town! Janice Iacona Ockershausen There you go. Andy Ockershausen: But Bob, having you on the air here was such a delight for everybody, because we could all relate to it, and we miss you, but there’s weather, and there’s weather, there’s so many people doing great things on TV now, and it’s part of life. Bob Ryan: But for me, I can, yeah, people say, “Don’t you miss it?” I say, “You can’t take the weather away from me!” I mean, the most fun I’ve had, I think the last few years, since I haven’t been completely working 100%, is having a snowstorm two years ago and just watching the snow. Oh, it was great! Andy Ockershausen: Did you predict it? Of course! Andy Ockershausen: Watching it and sitting right in there with them, you know. Andy Ockershausen: Or being there, or WMAL, all night long talking to Bill Mayhew. Bob Ryan: And I did that. It was fun. Andy Ockershausen: It was so important, though, Bob. Andy Ockershausen: A great, great day. You know, we say this, there’ll never be another Jim Vance and there’ll never be another time of him. There’ll never be another Harden and Weaver. But those things were an important part of our lives. But that all changes. Andy Ockershausen: And you proved that. Andy Ockershausen: Correct. All the way. Bob Ryan: … especially with the weather. That’s it. You can’t get through an app. You can’t get that through a two-second or two-sentence headline, which … but when there’s anything big, people will still watch live. Andy Ockershausen: Where they believe. Andy Ockershausen: Where they hear and they believe. Bob Ryan: And the trust element is there. Andy Ockershausen: Bob Ryan, you are a delightful man, and such an important part of Our Town. Andy Ockershausen: Absolutely! And you always will be. You can’t get rid of that, Bob. You can’t get rid of the weather. You can’t get rid of Bob Ryan. Andy Ockershausen: They can’t get rid of Ockershausen. They tried for years, though. Look, I never knew what a podcast was till Janet said to me, one day, “You oughta do a podcast.” And I said, “A what?” Now we call it radio without a transmitter, and it worked. Bob Ryan, thank you so much for being a big part of Our Town, and all the best to you. Bob Ryan: A delight to … great fun to be here. Andy Ockershausen: Great fun. If we hear any more Trumbull and Core tapes, we’ll call. Bob Ryan: There are a few others floating around out there. Andy Ockershausen: Andy Ockershausen, this is Our Town.